Reference number for this case: Oct-54-Saint-Brieuc. Thank you for including this reference number in any correspondence with me regarding this case. SAINT-BRIEUC. -- Several people claimed to have seen, at 300 or 400 meters of them, around 08:45 p.m., a "flying cigar", at an altitude of 50 meters approximately. The craft, they stated, could have been of 15 meters in length and it was lit by intermitences of pink gleams; it moved without noise. BREST. -- Mrs. Henry, farmer in Guesnou (the Finistère), claimed to have seen, Thursday, then Friday, in the evening at the same hour, in the sky, a violet cylindrical machine which moved without noise from the west to the east. LILLE. -- Mr. Anicet Corneille, farm labourer, stated to have seen, in Comines, a machine having the shape of a cigar, from 8 to 10 meters in length by 3 meters of width, which evolved wat some forty meters height and released a magenta gleam. After having flown over the city during a few seconds, the machine would have disappeared in the sky. The statements of Mr. Corneille were confirmed by a motorist of Tourcoing who was passing. Saturday evening, around 8 p.m., people worthy of faith saw what from now on is allowed to be called flying saucers or flying cigars. The mysterious machine moved in the sky of Favède, at 3 km of the mining city of Grand-Combe. "This apparatus, that we could see evolving during 10 good minutes, initially appeared to have the shape of a long cigar; it went down finally towards the high mountains from Lamelouze, on the left of the village of Ruffière, at the locality "les Drayes". It then had the appearance of a large ball surrounded by a luminous halation. Several people affirmed to have seen, at 300 or 400 meters of them, Saturday evening, around 08:4[?] p.m., a "flying cigar" at an altitude of 50 meters approximately. The machine, they declared, could be 15 meters in length and was lit by intermittencies of pink gleams, it moved without noise. Mrs. Henry, farmer in Guesnou (Finistère), claimed to have seen Thursday, then Friday evening at the same hour, in the sky, a purple cylindrical machine which moved without noise from West to East. Mr. Anicet Corneille, farm labourer, stated to have seen, Saturday evening, in Comines, a machine having the shape of a cigar from 8 to 10 meters in width, which evolved at forty meters of height and released a sharp blue gleam, after having flown over the city during a few seconds, the machine is said to have disappeared in the sky. The declarations of Mr. Corneille were confirmed by a motorist tourquennois passing in Comines. Saint-Brieuc, October 4 -. Several people claimed to have seen a "flying cigar" at 300 or 400 meters away from them, at approximately 08:45 p.m., at an altitude of 50 meters approximately. The machine, they said, may have been of a length of 15 meters and lit, by intermittencies, of pink gleams. It moved without noise. reaffirms professor Oberth, president of the "German astronautics society"
Hamburg, Oct. 4. -- "The flying saucers exist and represent at least ten percent of the craft observed in the sky", affirmed yesterday evening professor Hermann Oberth, German specialist in the rockets and honorary president of the "German astronautics society", during a conference pronounced in Hamburg. Professor Oberth added that it was possible, in his opinion, that these machines contain crews of creatures similar to humans, and proposed, to name these unknown beings, the term of "Uranides". The "Uranides", continued the German scientist, probably are several thousands of years ahead on our time. To explain why no "flying saucer" still crashed on the ground, professor Oberth suggests that perhaps the pilots have a perfect control of their machines, and that, for a reason which a human intelligence cannot imagine, they might not wish any contact with the terrestrial creatures. Considering another possibility, professor Oberth pointed out that the saucers observed could be regarded as an improvement of the V-7, German rockets of the end of the war, from which several prototypes would have fallen, according to the scientist, into the hands of the Russians in 1945. Chamonix, Oct. 4. -- From all the areas of France the news on the appearances of flying saucers continue to arrive and certain testimonies totally exclude the current assumptions of error or mystification. Thus very numerous people, among whom were the officers of the School of high mountain, the gendarmes of Chamonix, and pilot Guiron, known specialist of flight in high mountain, who flew over the area at that time, stated to have seen during more than one hour a shining machine move between Mount Lachat and the Mont-Blanc. Pilot Guiron indicated that, flying at approximately 2.000 meters above Faverges, he saw a machine which, he said, did not have any resemblance to a normal plane. Moreover, the direction followed at high speed by this apparatus excluded the assumption of a weather balloon. Saint-Brieuc, Oct. 4. -- Several person claimed to have seen, at 300 or 400 meters of them, towards 08:45 p.m., a "flying cigar", at an altitude of 50 meters approximately. The machine, they stated, could be 15 meters in length and lit by intermittencies of pink gleams. It moved without noise. Lille, Oct. 4. -- Mr. Anicet Corneille, farm labourer, states to have seen yesterday evening In Comines, a machine having the shape of a cigar, from 8 to 10 meters in length which moved at a forty meters height and released a sharp violet gleam. These statements were confirmed by a motorist rom Tourcoing passing in Comines. Nevers, Oct. 4. -- An employee of the slaughter house, Mr. Angelo Girardeau, 55 years old, resident of Breuil-Chaussée (Deux-Sèvres) stated to have seen Sunday morning while going to his work, a circular machine close to which was a being that appeared to him as covered a kind of diving-suit. That being moved towards Mr. Girardeau who, frightened, fled. A little later the circular machine set out again at high speed. Close to Saint-Brieuc, a luminous cigar evolved during more than one hour. Note: the full article can be read here. "My Martian was not shaven and had eyes as large as a corbel's egg"
The daily chronicle of the "flying saucers" grows more and more. Each day, numerous newsbriefs report the passage of mysterious machines in this or that region. It remains to be learned whether the bad weather that the complacent meteorologists announce obligingly, will have an unspecified influence on the gracious evolutions of the ethereal visitors. It does not seem to be that way, so far. To see a machine in the sky thus is nothing extraordinary any more and one could fear monotony if, fortunately, the "celestial pilots" didn't come from time to pay a short visit on the dry land and to bring with their height, their costume and their actions, more spice to the current controversies on the reality of the "saucers". In this field, the transitory ephemeral topicality is rightfully to be credited today to a modest bakery worker of Loctudy (the Finistère), Mr. Pierre Lucas. Standing up early and well awaken, our man was going to get water in the court of the bakery Tuesday morning when, in the wavering gleam of a rainy dawn, he saw a machine of the shape of a saucer of 2 m. 50 to 3 m. in diameter, which stationed there stupidly. He would certainly not have cared that much about it, if he hadn't suddenly seen an individual come out of it! "He measured 1 m. 20, resembled a man (sic) and approached me. Before I recovered from my surprise, he had tapped on my shoulder while articulating unintelligible words." "My Martian was not shaven..."
must have told him, for the unknown followed him in the bake house. There, one saw all the same a little more clearly and without shame the "Martian" let himself be contemplated. "He had an oval face, entirely covered of hairs and eyes of the size of a corbel's egg!" First thing thus learn until better information: the strangers that pilot the saucers have a human form, but the size of children, and apparently developed hair. Confirmation is given to us by Mr. Henri Lehérisé, young farmer of Megrit (Côtes-du-Nord), whose gift of observation did not await the number of the years. With much off-handedness, his own apparatus, whose diameter did not exceed one meter, was posed in the court of his farm. Two dwarves occupied it, motionless, impassive. They did not condescend to come out and engage the conversation. These two appearances obviously eclipse the "visions" of the day. Let us note however that the "saucers", threatened for a while by the barrels, balls, crescents and other cigars, launched a counter-attack of great style since there are now only talks of saucers. The one in Saint-Brieuc let itself be contemplated during one hour; that of the surroundings of La Rochelle hovered in front of the farm of Mr. and Mrs. Guillenoteau, within one meter of the ground, in an impressive silence and the farmer noted oily traces in the grass. In Lézignan, it was at the same time flying and giant: ten meters in diameter! Three meters only, the one that landed in the garden of Mr. Jean Labonne, in Bergerac, but on three crutches. Lastly, the "saucers" cannot always be approached: that of Lésignan, again, wrapped Misters André Garcia and André Darzens of a bright gleam before disappearing. The one in Clermont-Ferrand literally nailed the witnesses who wanted to see it closely on the spot and released a strong nitro-benzene odor. When the machine moved away, faintness ceased with the odor. Odorous, coloured and inhabited, the "saucers" are also international. In Mantova, they passed in tight formations and one of them was detached from the group to make a small air carrousel show which lasted one hour... and blocked the traffic in the center of the city, the witnesses having gone down in the street for better seeing. [er1] Article in the newspaper L'Echo Républicain, France, pages 1,4, October 7, 1954. PARIS, 6. - Several Parisians said they saw yesterday afternoon flying saucers moving in the sky of the capital. Bystanders claimed to have seen one at 4:30 p.m., near the porte Dorée. Mr. Pierre Allouis, cardboard reseller, was traveling in a cab for business when the vehicle was stopped by a red light. Hearing, he said, a shrill whistling sound, he looked through the window and saw a flying vehicle that fled in height, leaving behind a plume of smoke. Mr. Allouis described the saucer as a disc larger than a normal plane and of silver color. The same testimony is given by Mr. Gilbert Bason, residing 35, Faubourg St. Antoine, and Mr. Paul Julien, house painter, who lives 3, rue de la Pompe; the latter, however, believes that this is not a saucer but a flying wing that has the shape of a triangle with rounded edges. BERGERAC, 4. - Mr. Jean Defix, fireman in Bergerac and Jean Labonne stated they have seen landing in the garden of the latter, a luminous disc about three meters in diameter, supported by three legs. LEZIGNAN, 6. - Two residents of Lezignan Misters André Gardia and André Darsens, who were driving in a truck on the main road 3, said they saw a disc-shaped craft rise in a field between the village of Lagrasse and the hamlet of Villemagne (Aude). The craft, they said, was about ten meters in diameter. Before they could approach it, it wrapped a bright glow and disappeared. [...]oped MM. Andre and Andre Guardia Darsens of a glow before disappearing. The one in Clermont-Ferrand literally transfixed witnesses who wanted to see it up close and it emitted a strong smell of nitro-benzine. When the craft moved away, the discomfort ceased like the smell. Mr. Lehérissé claimed to have seen in the yard of his farm a craft of about 1 meter in diameter, within which appeared two human forms, motionless and the size of a child. NEVERS, 6. - In Nevers, five inhabitants of Château-Chinon said they saw last night at high altitude, a kind of bright spot, which split in two discs. These, they say, began to turn while changing color several times. DUNKIRK, 6. - A merchant of Dunkirk had, several days ago, reported seeing strange bright objects in the sky of Bray-Dunes. An investigation was opened. It concluded that they were two military airplanes whose metallic coating could have been misleading. Fragrant, colorful and inhabited, the "saucers" are also international. In Mantua, they rose in tight formations and one of them broke off from the group to make a small air carousel number that lasted an hour... and blocked traffic in the center of the city, witnesses being in the streets to see better. 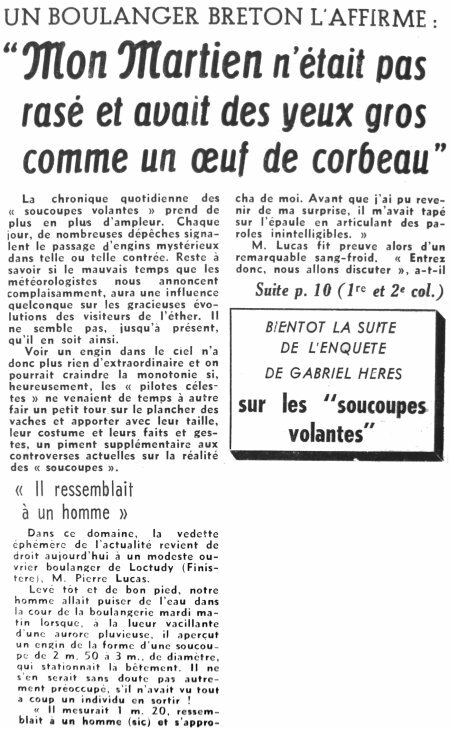 [lm1] Article in the regional newspaper Le Méridional, France, October 4, 1954. [lp1] Article in the regional newspaper Le Provençal, France, October 4, 1954. [yr1] Article in the regional newspaper L'Yonne Républicaine, France, page 3, October 5, 1954. 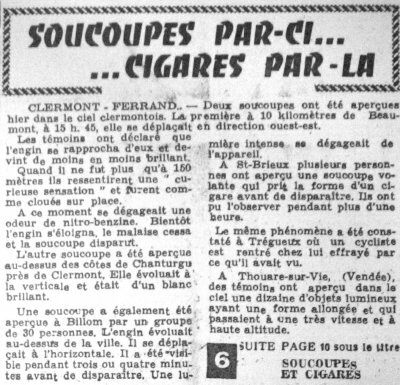 [la1] Article in the regional newspaper L'Alsace, Mulhouse, France, October 5, 1954. 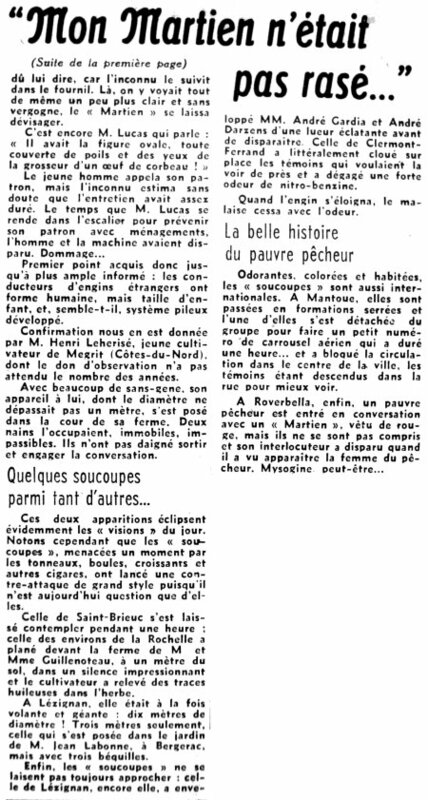 [lf1] Article in the national newspaper Le Figaro, France, October 7, 1954. 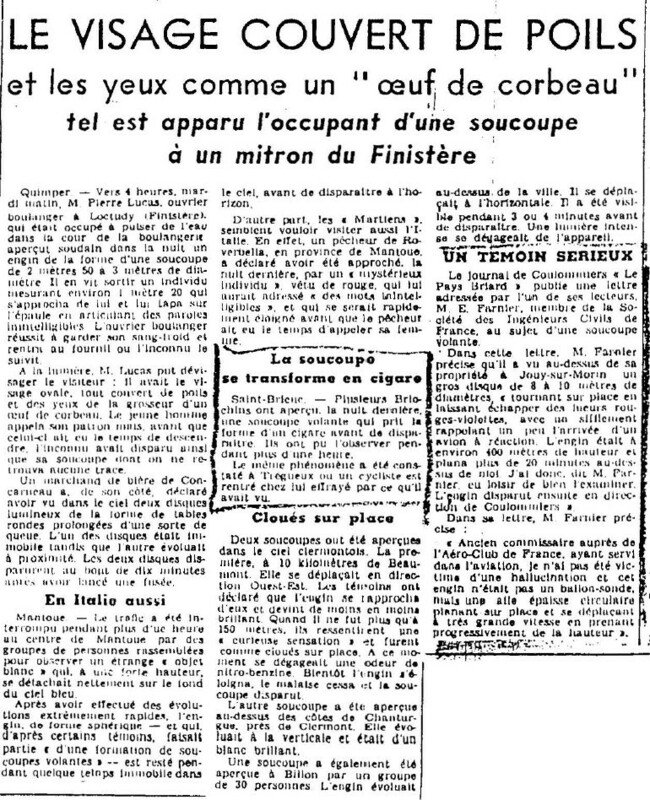 [lm2] Article in the regional newspaper Le Méridional, France, October 7, 1954. 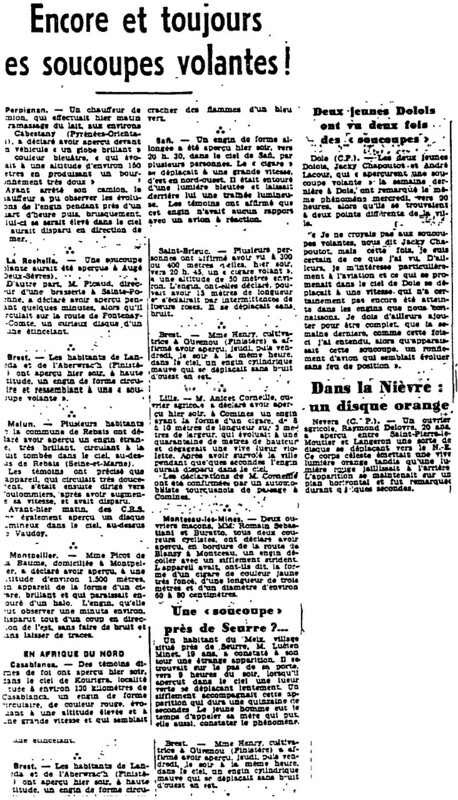 [le1] Article in the regional newspaper L'Est Républicain, France, October 7, 1954. 1.0 Patrick Gross March 15, 2009 Conversion from HTML to XHTML Strict. First formal version. 1.2 Patrick Gross June 4, 2010 Addition [la1]. 1.4 Patrick Gross August 15, 2010 Addition [lm2]. 1.5 Patrick Gross October 29, 2016 Additions [er1], [ub1]. 1.6 Patrick Gross December 22, 2016 Additions [pr1]. 1.7 Patrick Gross January 9, 2017 Addition [hm1]. 1.8 Patrick Gross January 11, 2017 Addition [nr2]. This page was last updated on January 11, 2017.